It is not a separate background type. The following effects are available for the Image and Video background types. 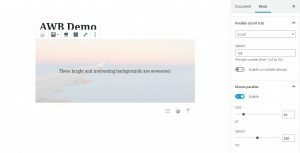 The Parallax options are available in Block Settings for image and video backgrounds. Disabled — Select this option if you don’t want to use the parallax effect. Scroll — If you select this option, the parallax effect is seen as you scroll the page. This option supports Speed values in this interval: -1.0..2.0. Note that if you set the Speed value as 0.0, the effect won’t be seen. 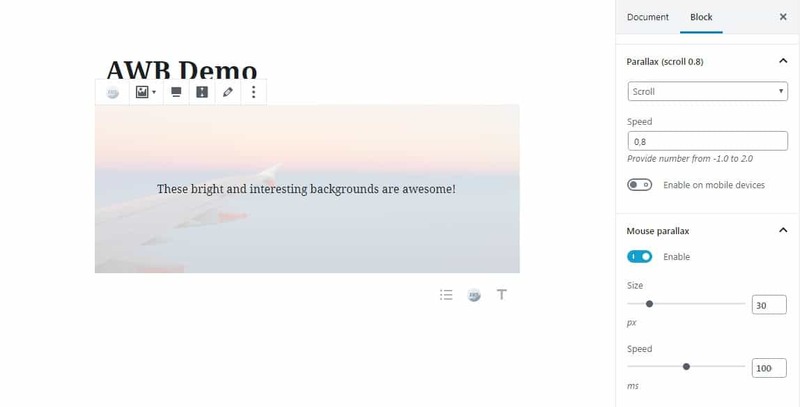 Scale — If you select this option, the parallax effect is seen as you scroll the page, but the effect is different: the background image changes its size. This option supports Speed values in this interval: -1.0..2.0. If you set the Speed value as 0.0, the effect won’t be seen. Opacity — If you select this option, your image has an overlay color effect, and this effect is hidden when you reach the block while scrolling. Opacity + scroll and Opacity + scale — These options combine the options mentioned above. This parallax effect is seen when you move your cursor. Also, you can see this effect on mobile devices: it reacts to the orientation of a device. Size — adjust this value to set the intensity of the parallax effect. Speed — change the Speed value to adjust the duration of the effect. The lower Speed value means a faster effect.